The Venezuelan government has condemned US sanctions against state oil company PDVSA for trading with Iran. The moves were "imperialist aggression", Venezuelan Foreign Minister Nicolas Maduro said. Washington imposed the sanctions on PDVSA and six other firms on Tuesday as part of a campaign to tighten sanctions on Iran over its nuclear programme. Venezuela is one of the biggest suppliers of crude oil to the US but its exports are unlikely to be hit. Under the sanctions, PDVSA cannot enter into contracts with the US government and will be barred from import-export financing. But the company's sale of oil to the US and the operations of its US-based subsidiary Citgo are unaffected. Mr Maduro told a news conference that Venezuela condemned the "hostile action" by the US, while energy minister and PDVSA head Rafael Ramirez said they were studying what impact the sanctions might have. 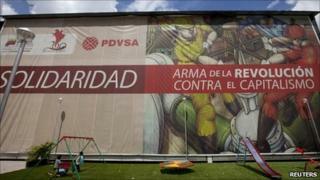 However, a source in PDVSA told Reuters they believed the sanctions would have little effect. "It's obvious this is just a political response by the Obama government to pressures from the Senate which has a position very hostile to the Chavez government," the source said. Ties between the Washington and President Hugo Chavez have long been strained. Venezuela sends about 45% of its crude oil to the US, although in recent years it has sought to diversity its markets, including shipping more to China. As well as PDVSA, the US imposed sanctions on firms based in the United Arab Emirates, Israel, Singapore, Monaco and Jersey. A US official said the sanctions would add "further pressure" on Iran to halt what the US and others believe is a nuclear weapons programme.